Apsolab BI allows you to consolidate your data from several sources into a central application with a web interface. This multi-user product will empower your organisation to take advantage of your valuable data isolated into silo. It has been designed to be used by non technical users. From its web interface, you can build KPI reports, charts and dashboards. 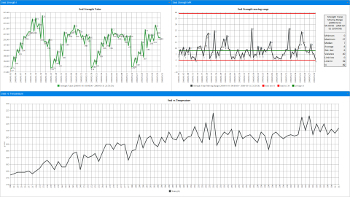 You can improve your process with our Six Sigma control charts and benchmark your performance. You can also monitor your data and receive alerts. Apsolab BI comes with many connectors to update your data in real-time. This product is highly configurable and will fit the needs of any organisation department. From manufacturing plant to upper management, Apsolab BI will provides a powerful tool to your organisation. Apsolab BI interface allows you to import/export data from/to CSV file. You can also create data entry forms with data validation. Apsolab BI provides a rich set of features. Most of them are listed in the table below. You can reorder columns or use the search tool to find any specific feature you are looking for. If don’t find what you are looking for, email us at info@apsolab.com. Data size unlimited There is no limit to data you can store in the product. (with the exception of your disk size). Native API yes API for C/C++ language. Native API SSL yes API for C/C++ language with SSL connection to server. Dynamic TAG API yes Feed server with data encapsulated in <tag> format. Dynamic TAG API SSL yes Feed server with data encapsulated in <tag> format over SSL connection. Connector toolkit yes Many connector and parser for scripting languages and libraries like Perl, Python, PHP and JAVA Log4j. Windows agent yes A Windows agent to feed server with Windows events in real time. Real time indexer yes All data sent to server is indexed in real time. Form yes Build forms and enter data from your browser. Chart / report yes Build charts and reports from your browser. Share chart / report yes Share charts and reports with other users. Chart / report updated in real time yes All chart and report are updated in real time. Chart wizard yes Wizard to build standard six sigma control cards. Save chart yes Save chart and report in your profile allowing quick access for later use. Print chart yes Print chart and report using your color printer and incorporate great information to your documents. Export chart yes Export char in PNG and JPG format. Export report in XLS, XML, CSV, TSV, HTML, PDF and JSON format. Six Sigma control cards yes Build control cards with our pre-defined charts ("Pareto", "I-MR", "X bar R", "X bar S", "P", "NP", "U", "C"). Dashboard yes Group charts and reports within the same window and have them updated in real time. Share dashboard yes Share your dashboard with other users. Slideshow yes Build slideshow based on selected dashboards. Display slideshow in big monitor or television in control room. Task manager yes Have the system run tasks at scheduled time to automate data import or any other tasks. Linux only. Real time data monitoring (alerts) yes Monitor your data for specific events and have the system create alerts. Email alerts yes Alerts can be sent by email in real time by the server. SMS alerts yes Alerts can be sent by SMS using your mobile operator "SMS by email" service. SMS are sent in real time by the server. View manager yes Create views to show only fields relevant to context. It's like viewing only selected columns in spreadsheet. Share view yes Share views with other users. Filter manager yes Build and reuse filters to select only dataset relevant to your context. Share filter yes Share filters with other users. Data cleanup yes Automated data cleanup allows you to delete records based on filters. Archiving yes Archive records based on filter or time. Archives are always available for access like your live data. Time zone selection yes Change time zone dynamically to see and process your data in other time zone. Dynamic input threshold yes Server can accept or reject new data based on priority (severity). You can tune the threshold live without having to restart the server or the connector. Update record yes Update any field based on unique key. Import CSV web interface yes Import CSV file directly from your web browser. Export data yes Export data in CSV format. Email data yes Send your data by email. Jira interface yes Create Jira issue directly from Apsolab-Console from selected records. LDAP yes Apsolab-Console can authenticate your users from any LDAP server including Microsoft Active Directory. Account manager yes Manage user accounts from your web browser. Permissions are based on role. Role manager (RBAC) yes Manage roles from your web browser. Record access control yes You can control who can access specific records based on categories. Each record has a unique category and category access is assigned in role definition. Password complexity yes If your are not using LDAP, you can control the password complexity level. Password expiration yes You can set a password expiration to force user to create a new password at the specified interval. Online help yes Most field label will show help information within hover. Documentation yes You always have access to online documentation and PDF manuals. Report yes Build custom reports. Create columns from formulas (expression evaluation). Export your report in many popular formats. Syslog parser yes Built-in syslog parser. Alert escalation yes Escalate alerts up to 3 levels. Data forwarding yes Automatically forward selected data to next node. Automatic backup yes A complete backup will be done automatically every night.